I went on another yoga retreat. This one was special. My friend Claudia Altucher gave it, calling it “Portable Yoga.” Claudia promised to give a thousand yoga tools to take away. I’m loyal. I would’ve gone even if she called it “You’ll Never Attain Enlightenment,” or “Yogis Study for 1000 Years, What Makes You Think You Can Get This in 2 Days?” but “1000 Tools” is a gift. Who can pass that up? I asked for this retreat for Christmas. “I’ll pay, you just have to watch The Boy.” Watching Declan is no small task–it counts as a meaningful gift even though it’s early. If Pandora Christmas can start after Halloween, I can plan a Christmas present before Thanksgiving. 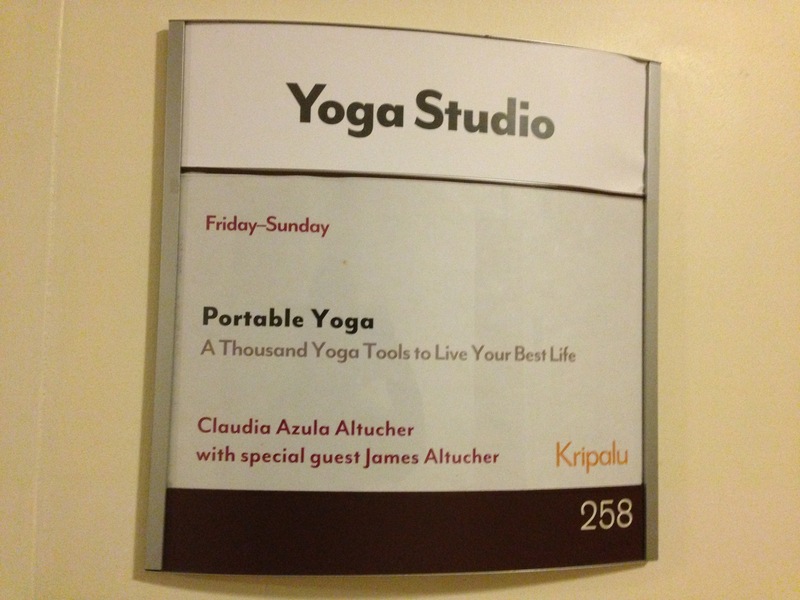 I’m glad Claudia called her retreat “Portable Yoga.” It made me feel I had a shot–that I, too, could learn to “engage my bhandas” or even find them. That I could point my tailbone to the ceiling by myself and remember some things to practice, even though I’d be going home to a seven-year old who sniffs out yoga, destroying it with the efficiency of a guerilla warrior. I told her back then I couldn’t take it with me if I forgot, so she made me some videos and put them on her website. She probably made them for everyone, but I like to think the world centers around me on occasion. I get up early and write while watching the sun rise over the mountains. I take the same mountain pictures every time. I get ideas. I decompress my brain. I enjoy peace. A little child walked by with her dad as I wrote. I thought I’d like to bring my boy one day. Then I remembered mine is the Yoga Guerilla. The types of boys and girls that come on yoga retreat are ones that walk around quietly, little lamas in training. They don’t scream and interrupt enlightenment. I interrupted enlightenment enough breaking retreat rules. “I want you to look within, not be all over the place, on Facebook, email. We will observe ‘functional silence’ tonight.” said Claudia. I lasted six minutes exactly. I made a new friend and had tea with her immediately. I talked all weekend with my yoga soulmate, Marianne, who came for a weekend of rest and relaxation herself. Last retreat Claudia gave me an “In Loving Silence…” badge. I called it the “shut up badge.” It frightened me. If I’m quiet too long, I explode. This time, no badge. Claudia trusted us. I felt even more guilty. I was trying to get one step closer to inner peace and still have fun with my friend. Yoga multitasking. If I could do all that in a head stand, I’d be golden. “Yoga” and “multitasking” should not be a forced marriage. I didn’t really “turn within.” My brain races when I’m silent, the echo of a thousand ideas speeding through the wind tunnel that is my mind. It’s okay. I was happy. I’m not a very good yogi. “I want you to sit in silence for one hour,” Claudia said one day, x-raying my wind-tunnel mind. I laughed–I can’t sit in silence for one hour living with The Yoga Guerilla. “Okay, twenty minutes.” She gave in like a doctor who knows the patient won’t obey, so she has to issue the next best prescription. That’s why she developed Portable Yoga–I really should do the full hour but she’s prescribing me something I can handle. Getting away for retreat meant that I could sit in silence for the required amount of time. Because I felt guilty, I escaped and meditated for an hour, but I became depressed so I broke functional silence again with my friends, new and old, finding my happy once again. I hoped I’d be better about my practice when I returned home. “Even if you get to the edge of the mat every day for five minutes…that’s a practice,” said Claudia. She always takes time to remind me when life takes me away. The thing I’ve realized is this–life takes us all away. We’re all the world’s worst yogi in our own mind. It’s how wind-tunnel minds work. One thought gets in and swirls and swirls until it’s all-consuming. Then something brings it back to mindfulness, good habits, and our practice. The entire secret of life is having a small group of good friends who know this and who never stray at exactly the same time. This way, there’s always someone on the path to say, “Come back.” We all end up a little better. I left retreat deciding I was never going to be enlightened. It’s too hard. But I left happy, with a thousand tools to take with me. For that, I give Portable Yoga an A+. That’s a pretty high rating from the world’s worst yogini, but Claudia deserves even more gratitude for not yelling at me when I broke the rules. I wonder if yoga teachers are allowed to yell, anyway, or whether they can just tie people in pretzels and leave them there to meditate for all of eternity? That’s a question I’ll ask on the next retreat.